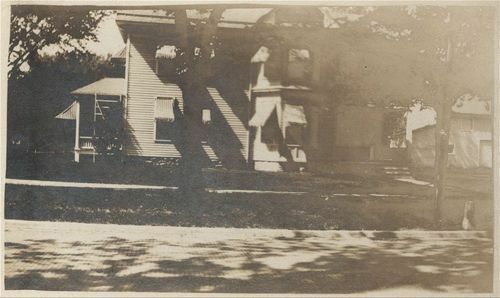 A photograph of the Edward House home located at 1646 Massachusetts, Lawrence, Kansas. Built c. 1894, it is significant as an example of balloon-frame Free Classic Queen Anne residential architecture. The Queen Anne style became the dominant residential style in America from 1880 until 1910. Known for its asymmetry and rich surface textures, the style provided an opportunity for both high-style designers and vernacular builders to incorporate some or all elements of the Queen Anne in residential architecture. Queen Anne features on this house include a steep hipped roof with lower cross gables, tall narrow windows, and decorative eave brackets. At the time the photograph was taken, Carl Friend, a Lawrence lumberman, banker and politician, owned the house. He bought the house in 1909 and sold it in 1926. The home is on the National Register of Historic Places in Kansas.